The Terminal City Club has generously agreed to be our venue sponsor so get ready to enjoy an evening of fine dining, great wine and engaging entertainment! We are delighted to have live classical music sponsored by Steinway & Sons and Tom Lee Music. For the brave, we will also have two world-class Tango instructors who will perform a live show and a group class. Don't forget to bring your dancing shoes and remember, it takes two to Tango!! This special evening will then continue with a silent auction and all sorts of fun games to help raise funds and most importantly to laugh and have a great time. This is a wonderful opportunity to show our family, friends and prospective members "Who we Are", "What we do at Rotary" and especially "How Proud we are of being Rotarians!" Thank you in advance for your support and we look forward to seeing you all! Note: The cost of $100 plus tax includes 3 course dinner & wine, dessert, prize and live show. A cash bar will also be available for guests to buy wine and other beverages. 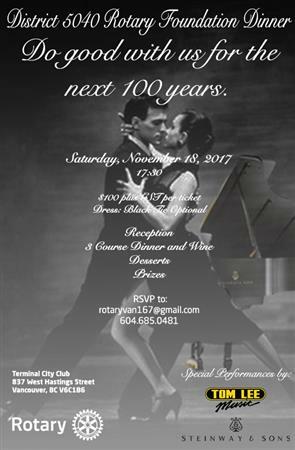 Net proceeds from the Foundation Dinner evening will be donated to the Rotary Foundation Canada, the financial cornerstone of Rotary's many overseas and local projects. Our goal is to raise at least $20,000. Feel free to fill in the attached Prize Donation Form and email it to gallosanmartin@gmail.com.